This is a page about the 'test slide' provided with Gould's 'Improved Pocket Compound Microscope. 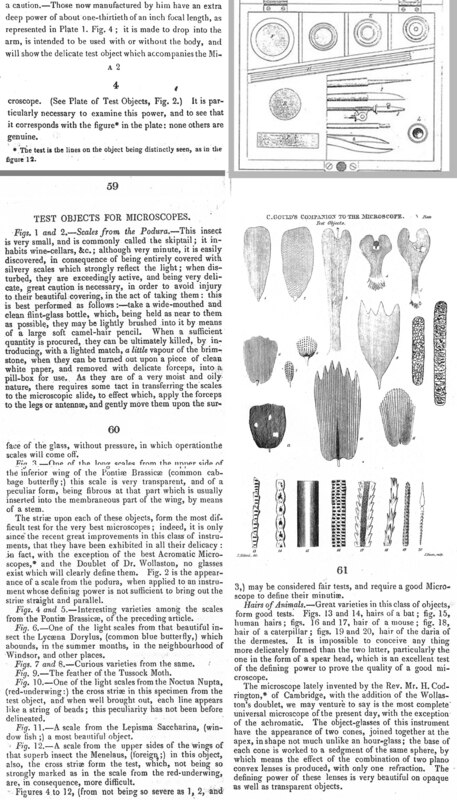 Although Gould refers to many different test objects in his book, and these were apparently supplied as part of small or large sets, (see for example a small set of test objects supplied with a more sophisticated Cary microscope in this collection) he refers to one in particular that is to be used to confirm the authenticity of the microscope because it could be resolved only by the special high power lens only supplied with his little microscope. The relevent text of Gould's booklet is produced here along with the engravings to indicate the high power lens, and the test objects. The reader will note that in the first part of the booklet, Gould states the test object for high power tests is figure 2, but the footnote refers to figure 12. Figure 2 would be scales of Podura while 12 is scales of Morpho menelaus. The only test slides that have come to light that were included in a Gould kit contain scales which include Morpho menelaus. Since there are multiple typographical mistakes in this booklet, it is possible this is another typographical error and the intent was to refer to only one figure, and if the existing test slide is indeed the one referred to, it would be figure 12 rather than 2. Another possibility is the test slide was to contain more than one type of scale, but the slide in question seems to contain no scales of Podura. Thanks to Joe Zeligs for the images of the purported 'test slide' and the scales found on it. 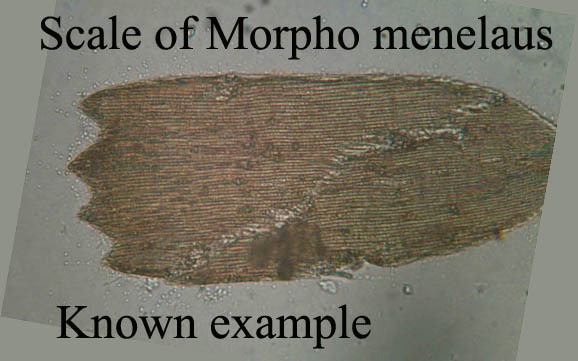 To make matters even worse, although the text legend states figure 12 is the scales of morpho menelaus, the actual figure of menalaus is figure 10! Figure 12 is still another type. It seems Gould's typesetter was not very careful, or alternatively, they could not read what Gould had written. I WOULD BE VERY GREATFUL FOR ANYONE WITH ANOTHER TEST SLIDE AND THE SCALES PRESENT ON THE SLIDE TO CLARIFY THIS ISSUE. PLEASE CONTACT ME AT: Collector@microscope-antiques.com.